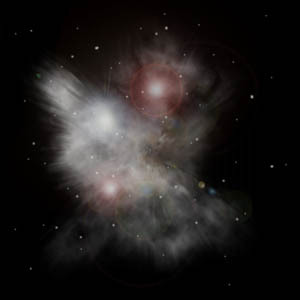 The above image is an artist rendering of VY CMa by former AAVSO staff member Neil Braun. VY CMa is a collection of several star-like nuclei within a dense nebula. It appears as an oxygen-rich red star of spectral class M3-4II. (1) It is known for its unpredictable behavior and for its strong infrared and microwave signals. Shining on average between visual magnitudes of 7.4 and 9.6, it is bright enough to be seen through small telescopes or even large binoculars when bright, yet is a challenging star to observe because it is red, which makes it difficult to estimate its magnitude. The best way to observe this star visually is to make observations with the quick glance or out-of-focus methods once a week from season to season and year to year. Photoelectric and CCD observations are especially welcome, especially multi-colors ones. There is now general agreement that the companions of VY Canis Majoris are bright "knots" in the nebulosity that shrouds the entire system. From observations with telescopes from 36 to 120 inches aperture, Herbig found... : "The image of the variable is neither stellar nor round and attached to this elongated blob is a curved nebulous tail..."
Stellar masers are found near long period variable stars (LPV)s, and arise when the turbulent upper photosphere of a luminous star undergoing mass loss is exposed to the radiation from below. These stars are typically class M (with 10^4 solar luminosities) and have cool surface temperatures, usually around 2500K. Since these stars are evolved, their photospheres contain appreciable abundances of heavier elements, such as Si. SiO masers are almost always found in these environments. The LPV VY Canis Majoris is a prime example of such a star. The first report of the variability of VY Canis Majoris appears in the star catalogue of Lalande, which lists VY CMa at a visual magnitude of 7 on March 7, 1801. VY CMa was a relatively well observed star throughout the 19th century, thanks in part to its brightness and redness (which makes changes in magnitude more noticeable, but difficult to estimate accurately). Most of these observations were made with instruments of 6 inches of aperture or less. It was pretty much believed to be a single red star during this time period. Between 1900 and 1917 no known observations of this star exist. However, in the 20th century larger-aperture telescopes became more available for observing. "In 1917 Guerin was using the new 7.5-inch meridian circle at Cordoba Observatory... when he noticed 'three nuclei'" (Robinson, IBVS 599) and so VY CMa was recognized as a multiple-companion system. During most of this period the unique variability of the star went largely unnoticed. On September 1, 1970, L.J. Robinson released the preliminary results of a study he made using 2,000 astronomical photographic plates in the collection of the Harvard College Observatory (IBVS, Number 465). VY CMa was thrust into the spotlight and ever since has been a popular and challenging variable star. 1- Table of Bright Infrared Sources, NOAO. 2- Ghavamian, Parviz. An Introduction Into Astrophysical Masers. This month's Variable Star of the Month was prepared by Aaron Price.